Israel is protecting Europe from terror. 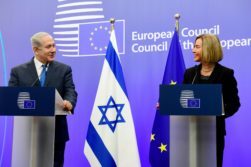 PM Netanyahu and EU foreign policy chief Federica Mogherini. Illustrative. 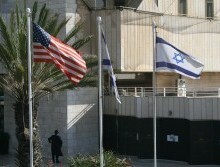 Photo courtesy of: Avi Ohayon (GPO). 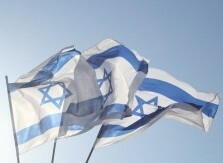 Israel is often at the forefront of the voices concerned about Islamic terrorism and the nuclear and non-nuclear threats from Iran. But Israel is also at the forefront of fighting back against those dangers, and it’s not just Israel that’s being protected by those efforts. Europe and the rest of the world benefit as well. On Tuesday, Israeli Prime Minister Benjamin Netanyahu highlighted the risk posed by radicals such as ISIS and Iran and what that means for friendly foreign powers. “We are committed to blocking [radicals’] advance and in so doing, we are defending not only ourselves, but in many ways, defending Europe,” Netanyahu said in comments released by his office during a meeting with Austrian President Alexander Van der Bellen. 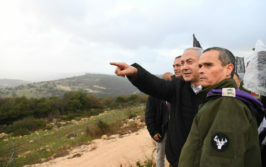 PM Netanyahu in the north. Israel on Sunday announced the end of Operation Northern Shield, in connection with their uncovering of a sixth cross-border tunnel linking Israel and Lebanon. The terror tunnels, built by Hezbollah in violation of United Nations Resolution 1701, are believed to have been intended as a method to send terrorists into Israeli territory to launch attacks. On Sunday, Israeli Prime Minister Benjamin Netanyahu reported the “successful close” to the operation aimed at neutralizing the tunnels in comments released by his office, while also noting the danger that had been posed by the underground structures. 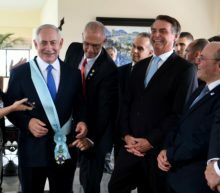 While Netanyahu didn’t give a date, President-elect Bolsonaro is set to take power on January 1. The Christian population in the State of Israel grew 50% faster in 2017 than the year before—increasing by 2.2% versus 1.4%—and now numbers approximately 175,000 people, according to the latest numbers published by the Israeli Central Bureau of Statistics (CBS). While accounting for just 2% of the Israeli population, the success of Christians underscores the egalitarian nature of Israel. Christians on average are doing well from an employment perspective—roughly two-thirds of all Christians in the country aged 15-years-old or older were employed, compared to 65.1% of Jews per CBS numbers from 2015. Educationally, 78.5% of Christian 12th grade students in Arab education were entitled to receive a matriculation certificate in the 2016/2017 school year, just 0.2% behind the students receiving a Hebrew education. Over 77% of all Christians in Israel are Arab, but they have had more success than their Muslim counterparts: just 59.5% of Arab Muslims were entitled to graduate from 12th grade in the 2016/2017 school year.